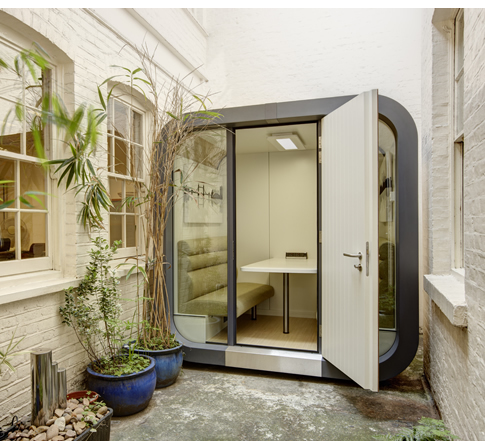 Garden Office | Office Space by OfficePOD®. Through their unique ability to be located both outside and inside buildings, OfficePOD’s range of products offer unrivalled choice for those who need to make better use of their valuable real estate. And when a lack of space and privacy risk compromising basic operational effectiveness, productivity and even morale, we can create new space in underused areas such as lightwells, courtyards and atria. Break free from the constraints of inflexible buildings where change often results in long periods of disruption, inconvenience and mess for all concerned. OfficePOD’s modular construction ensures that crucial facilities can be created with speed and without disturbing the existing building or, more importantly, its occupants. The high overall acoustic rating of Dw 39dB ensures that our PODs succeed in creating private, relaxing and inspiring spaces to be in. 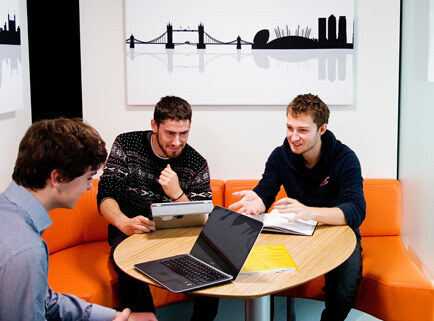 So, whether it’s the need for meeting PODs, interview rooms, edit suites or just somewhere to relax and think, OfficePOD are able to create spaces that enhance existing facilities, boost flexibility and increase productivity. Moreover, the unique structural panel system is robust and allows the PODs to be easily dismantled and relocated and refitted time and time again, thus allowing them to adapt to your changing needs, reducing waste and long term redundancy. Please call the sales team on +44 (0)1462 418050 or email sales@officepod.co.uk to find out more.